Japanese toy giant Bandai has now jumped on this train back to the past as well. 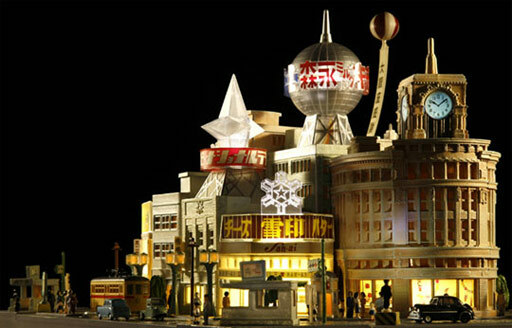 This April it starts selling a beautiful diorama of Tokyo’s Ginza during the Showa Period. It is the first release in what the company has named the Time Trip Series. The table top display measures 30 × 40 cm (11.8 × 15.7 in) and brings Ginza’s 4-chome crossing back to live as it looked around 1955 (Showa 30). It features the Hattori Building, long an iconic mainstay of Ginza; National Panasonic, Snow Brand (Yukijirushi), Toshiba and Morinaga signboards; a moving Tokyo streetcar; a number of grey suited salariman as well as women in period clothing. The charming time travel set is mounted on top of a sophisticated control panel with speakers for appropriate soundtracks. At a whopping 198,000 yen,1 this toy is definitely not for kids, but for their grandparents who were still hopeful youths busily rebuilding Japan from its wartime ruins when the Ginza actually looked like this. 2 For more information and technical specifications, see Bandai’s press release (in Japanese).